Got kids in the house? Then you will know all about the cute cartoon character Doraemon and his love for Dora cakes. These are easy to make, and children will love it. Take a bowl, add 2 eggs and sugar. Beat well until frothy. Then add vanilla essence and beat again. Now add flour and honey and mix well. In a small bowl, pour water and mix in baking soda. Pour this mix into flour batter and combine well. It should have pancake batter consistency. Heat a flat pan, apply a little oil on it. Take a small ladle of the batter and pour onto the hot pan. Let it get warm and allow bubbles to form around the edges and inside also. Flip over and cook both sides until golden brown. Repeat the same until the batter is over. Then spread any chocolate cream like Nutella on one pancake generously and close with another pancake. Now you get a Dora cake, which is a sandwich with chocolate in the middle. You can use any chocolate cream that you like, but here we have opted for Nutella. 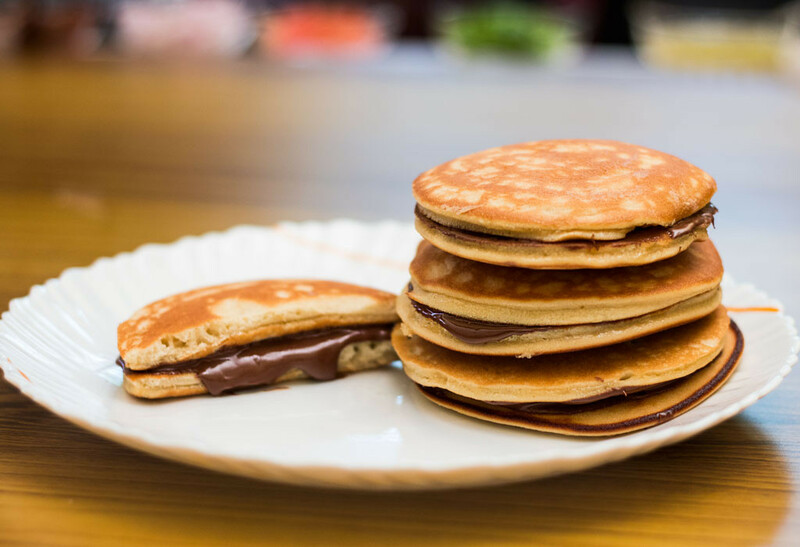 If you have a variation, maybe you could mix in a teaspoon of crunchy peanut butter in the choco spread and fill in the pancake.